New Crochet Pattern Bundle: Goodbye Winter. Hello Spring Fever! Over 40 Patterns For Over 90% Off!!! Plus a Freebie From Me!! Cozy candles, warm blankets, rich cocoa, and snugly sweaters—these are all some of my favorite parts of Winter. But there’s a time and place for everything, and I don’t know about you, but I have a serious case of Spring Fever! Spring is finally here and that means warmer weather, new beginnings, and fresh, clean feels all around. That’s why I’m so excited to announce the Ultimate Spring Fever Crochet Pattern bundle! Spring weather doesn’t mean saying goodbye to crochet. It just means saying hello to warm weather patterns that are perfect for Springtime. That’s exactly what you’ll get with the Spring Fever Crochet Pattern Bundle. The folks at Ideal Me have worked hard to curate over 30+ patterns in this bundle. They have been hand-picked by top Etsy designers and crochet bloggers. The bundle features lightweight, Spring ready patterns, pastels, amigurumi, and everything you could want to help you get your crochet on all season long. The patterns range from tops and bags to sandals and pillows. And each pattern is so cute, you’re guaranteed to get compliments on each one. My Ocean City Flip Flops are in there too! 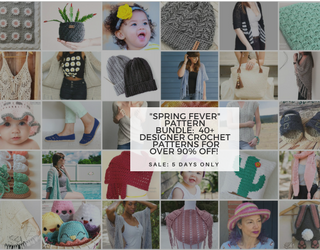 Now through April 6th, you can get all 30+ “Spring Fever” crochet patterns worth over $200 for over 90% off…but make sure to take advantage of this deal now because once the sale is over, it’s never coming back. Why wait? Ring in Spring the right way—with a little crochet. Basic Slouch No. 2 Hat by Mollie of White Owl Crochet Co. The Mila Cardigan by Mollie of White Owl Crochet Co. The “Spring Fever” Crochet Pattern Super Bundle has over $200 worth of resources and you get it all for 90% off retail because we never want you to overpay for patterns, and we’re so excited to celebrate Spring with you. You’ll want to snag yours now because the bundle is only available through April 6th. If you’re a crochet lover of any level, I know you’ll love this super bundle as much as I do, and I can’t wait to see all of your finished projects. It has the power to transform your crochet arsenal with tons of cute, trendy, and original patterns that you can use over and over again. Not only will you get all these awesome patterns, but when you make your purchase, you will get an extra free pattern of your choice from my shop. All you have to do is hit the contact shop in my Etsy shop and attach a copy of your receipt in the convo and let me know which pattern you would and your preferred email and I’ll send it right over.